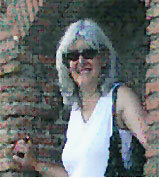 Betty Jo Mayeske, PhD, is the originator of the Pompeii Food and Drink Project. Her BA and MA are from the University of Illinois and her PhD is from the University of Maryland, College Park, under the direction of Professor Wilhelmina Jashemski. She was an Adjunct Professor of History for 36 years. She taught Roman Republic and Roman Empire and Classical Cities (Rome, Pompeii and Tikal), and she served as the Chair of Humanities for seven years, University of Maryland, University College (UMUC). UMUC has the largest student count in the country. She was the first professor to receive the University’s highest teaching award. She has studied and worked in Pompeii for over 35 years, catalogued the bakeries within the city and published articles on specific bakeries. Dr. Mayeske has designed, directed and administered college degree courses and concentrations for adult students who need to learn at a distance. In 1976, she was awarded an honorary degree by the Open University of the United Kingdom and delivered the commencement address in Glasgow, Scotland. FEMA and the U.S. National Fire Academy honored her achievement of designing and developing a Bachelor’s Degree for Fire Fighters working and residing anywhere in the USA. She is a former Board Member of the Archaeological Institute of America, Washington D.C. society and the Santa Fe Institute for Native Hispanic Cultures. She was elected by faculty for a total of 16 years to all the faculty Boards at UMUC. Dr. Mayeske received the University of Maryland University College’s Distinguished Achievement Award in 2013. Dr. Curtis has worked in Pompeii and Herculaneum since 1973 and has published articles and books on ancient food technology, garum production, Latin epigraphy, and Roman long-distance trade. Dr. Lowe has taught at Maynooth University, the University of St. Andrews, Aarhus University, Western Oregon University and the University of Georgia. Present and past fieldwork include sites in Roman Britain, Israel, Jordan, Cyprus and Spain. Dr. Lowe has published books and articles on Spain, the Ancient Economy and Roman History. Associate Dean for the College of Visual and Performing Arts, George Mason University, Virginia. Dr. Kahn has conducted archaeological investigation in Italy, Israel, Cyprus, France, and Portugal with specialization in material culture. She has published on ancient beer; ancient glass; Greek kiln technology; and King Herod?s temple in Caesarea, Israel. She teaches courses on History, Archaeology, Art History and Cultural Heritage Preservation. Dr. Kahn is also an annual lecturer for the Archaeological Institute of America. Our staff is a diverse group who bring a variety of skills and passions to the Project including photography, drawing, editing, computer database design, analysis methods, GIS analysis, and academic work in archaeology, anthropological archaeology, ancient history and classics. Retired program specialist, assumes general management roles in several areas. Architect, Wright Patterson AFB, has experience in Roman Tunisia, Pompeii. Drawing Team Mgr..
MA in Anthropological Archaeology. 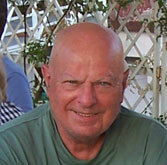 Tenured professor at Macomb Community College in Anthropology and Archaeology. Directs Macomb County Historic Graves Project. Principal Researcher and Volunteer Coordinator. BA, Univ. of So. CA. Professional newspaper photographer, author of travel articles and a book on airships. Leader of Photography Team. Heather Caple earned her Masters in Art History, having concentrated on textiles, trade, and domestic and social organization in the Roman Empire. These interests coincide with her position as a Drawing Team leader with the Project. In her other life she is an executive with a private loan company and an aspiring archaeological illustrator. Heather also acts as assistant to Prof. Mayeske home and abroad. Twyla Howse is a graduate of the University of Maryland, College Park and NCIDQ (National Council for Interior Design Qualification) qualified interior designer with over 30 years’ experience in the commercial field. In addition to her interior design business, she has been a tutor with Rhodec International Interior Design School for 10 years and is also a member of IDEC (Interior Design Educators Council). Teaching specialities include the History of Interior Design and Colour. Currently she is an Account Manager with Dornbracht (Luxury Spa Fittings). She is also a computer database specialist and major problem solver. Rob Brown is a senior Ancient History teacher from Sydney, Australia, specializing in Roman History, specifically the Vesuvian cities and Malta. He holds an undergraduate degree in Ancient History and Archaeology from Macquarie University and recently has completed a Masters in Ancient History and Archaeology, as well as a Graduate Diploma in Ancient Languages. Sean Cahall serves as a Database Manager and is a senior web developer with 19 years experience in the IT industry. His resume is most extensive. He earned a BA at St. John's College, Annapolis, MD, and a BA from the University of Hawaii-Hilo, HI. He reads and speaks several languages. He also has a background in classical studies in addition to his IT work and has had the chance to visit many classical sites. He has a family connection to our academic community in that his mother earned her Masters Degree with Wilhelmina Jashemski. Archivist, St. Louis Jewish Community Archives, Holocaust Museum & Learning Center, and Enterprise Holdings Inc. Dr. Everman holds a BA and MA in ancient history from Oklahoma State University and a doctorate from University of Maryland-College Park where her dissertation focused on the water supply system of Caesarea Maritima. Her past and present archaeological work includes Rehovot ba-Negev, Caesarea Maritima, Tel Tanninim and Summeily in Israel, the Nova Triana Roman Villa Project at Castel Viscardo, Italy, and the Helike Archaeological Project, Greece. Diane has presented papers and published on a wide variety of topics, including excavation reports, ancient water technology, and 19th and 20th century history. Steve Jenness is a Senior graphics designer, photographer, writer and videographer and a graduate of the University of New Hampshire. 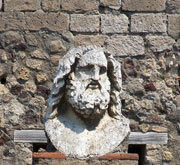 He frequently visits Italy and ancient sites around the Bay of Naples. He has worked several field seasons with the Project, as both a team member and staff. When not in the field he continues to work with project database graphics and the video of the project workers at work and play. He has been with the project since its first year. Larry Ludwicki is a retired Information Technology manager as well as a designer and implementer of mainframe based automotive computer systems. Since his retirement, he has enjoyed travel and photography amongst other activities. This will be his fifth year as a participant in the Pompeii Food and Drink Project. He will direct the photography team this season, as well as working some afternoons with the database. Sean Marcia serves as a Database Manager. He earned a BS in Economics from George Mason University and a MS in Economics from the University of Oregon. Currently he is taking PhD level Operations Research course at George Mason University. He provides web support for the project and introduced Ruby on Rails to the project. David Mayeske serves as a Database Manager. He first visited Pompeii when he was nine years old. He earned degrees from the University of Maryland, College Park in history and from the University of Maryland, University College in IT studies. John Mayeske serves as a Quality Control specialist. 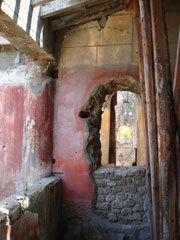 He first visited Pompeii when he was seven years old. He will help provision staff and team members and will help order and preserve all project equipment. He takes photographs and organizes the photo positions in the database. Diane McLaughlin is a former Project team member, engineer, and A+ GIS student. Diane, working with Betty Jo and Kevin, directs our GIS (Geographic Information System) efforts. GIS integrates hardware and software and data to capture, manage, analyze, and display all forms of spatial and geographically referenced information. She presented a poster at the AIA convention about GIS and the Pompeii Food and Drink Project. Cindy Morton, a graduate of the University of Maryland, College Park in Interior Design owns her own company CDM Designs and Colorworks and serves clients around the country. She specializes in decorative painting, faux finishes, and murals. Cindy painted huge Pompeii Garden wall murals in Betty Jo and George’s house. They are a joy to behold. Suzanne L. Stone, archaeologist. M.A . Archaeology, University of Leicester. Suzanne has professional and archaeological knowledge with 17 years of experience in excavation, curation, artifact conservation and treatment, laboratory analysis, and teaching. Research interests include ancient viticulture and enology, kitchen gardens, food, apiculture, glass, and tattoos. Sherry Williams reports a lifetime love of archaeology. In 1978 she volunteered to work with the King Tutankhamen exhibit in Seattle. After retirement from 25 years of being a corporate travel consultant, she has spent the last 12 years with the Pompeii Food and Drink Project, which has been immensely enriching. Last year she also spent a week with the Oplontis B project, cleaning potsherds, pottery and other interesting finds. With Pompeii Food and Drink she has worked on measuring, photography, dictation in the field and data entry. This season she will also assist with organizing team member tasks, field managing and staff meetings. in the future she looks forward to editing the database as it is refined. Leslie Xavier was President of the Naples International Archaeological Society and recently returned to her home in Annapolis, MD, after living in Italy for five years. She is in Japan these years. She is an Architect and a Structural Designer. She recently completed a BA in Art History at UMUC. She is a fine artist and her paintings grace the walls of many lucky project workers. Supreme god of the Roman pantheon and project protector (we hope). Throughout all of our years we have received the support of the following Italian authorities: Profesoressa Teresa Elena Cinquantaquattro, Soprintendenza Archeologica di Pompei and previously Dottoressa Mariarosaria Salvatore and Dott. 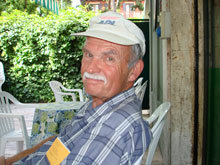 Pietro Giovanni Guzzo, retired Superintendents of Excavations, for authorizing our previous research in the scavi. Thanks also to Dott. Antonio Varone, and Dott. Antonio D'Ambrosio, former Directors of Excavations at Pompeii for their assistance in facilitating our work. Sig. A. Boccia and the custodians of the city have been responsive to our needs and afforded us every courtesy. Dottoressa Greta Stefani has offered us helpful advice and graciously conducted us through the exhibits at the Antiquarium in Boscoreale. She is the excellent Director of Pompeii. 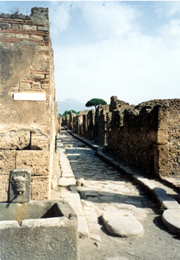 Suprintendent Massimo Osanna authorizes our study and work in Pompeii. With great respect we acknowledge the fine effort and hard work of all associated with the protection and prosperity of ancient Pompeii. Contact Pompeii Food and Drink by Email.